So this is how I know I’m never going to make it as a food blogger: I totally forgot to take a picture of the finished cake that I made for the the little one’s third birthday. Circumstances meant that the cake actually turned out quite nice – she was sick on the day that we’d scheduled her party, so the cakes, baked but not yet decorated, went into the freezer until the following weekend. That’s how I learned that it’s much easier to frost a frozen cake than a fresh one. The cake is sturdier and crumbles less, so the surface for the fondant layer turned out much smoother than it had been for my previous efforts. 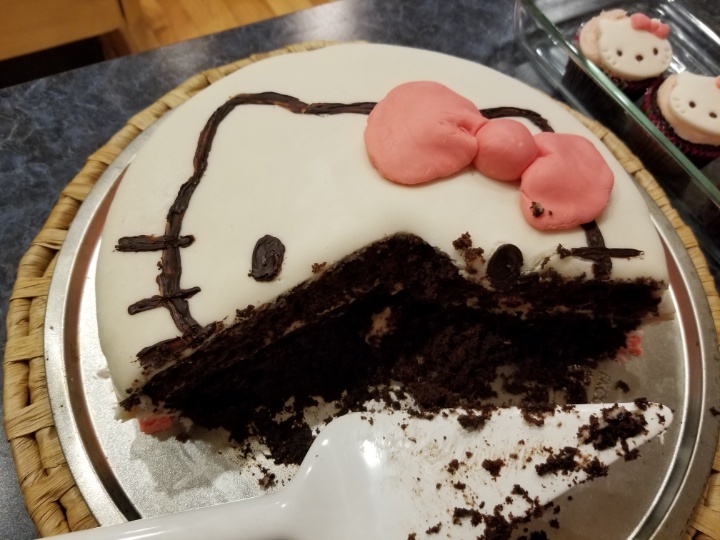 I made a chocolate cake with strawberry frosting, with a Hello Kitty on it, because that was what the little one requested. “I want that one!” Determined pointing. Kids have no respect for your desires. This is something you learn very quickly as a parent. Oh, two years going on three, so malleable. At five years old, the older kid is already wise to these tricks and requires more straightforward negotiation. Anyway, my objective restored, I made marshmallow fondant (I use this recipe, recommended to me by a friend whose intensity re: baking is at levels I can only admire), kneaded up some of it with a drop or two of red dye (if you want an arm workout, may I recommend kneading fondant?) 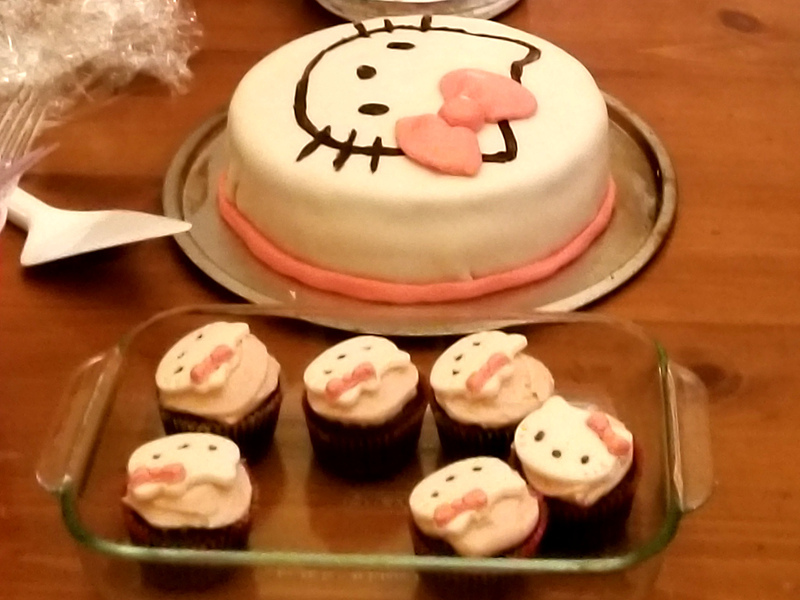 to make pink, and executed Hello Kitty cake toppers and chocolate cake. (Three batches of smitten kitchen’s “I want chocolate” cake, for two layers of 9″ round and one dozen cupcakes.) Also strawberry cream cheese frosting, because the kid wanted strawberries, and I like cream cheese. The little one helped with the cake toppers. 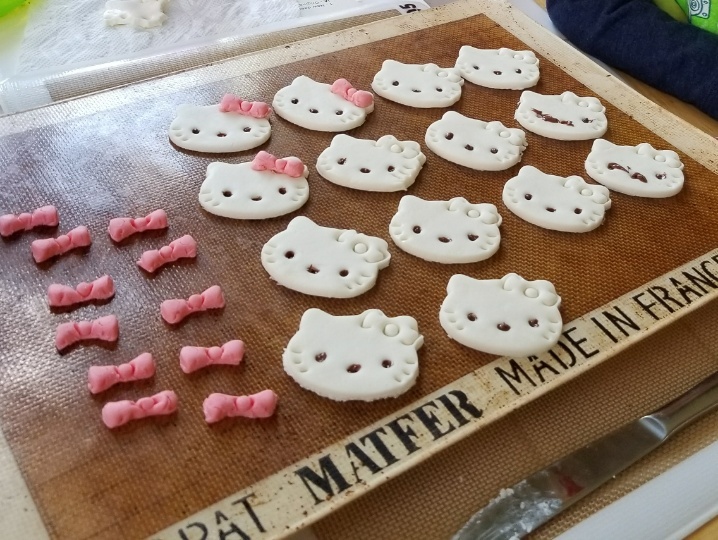 I used the cookie cutter twice – once for the head on the white fondant, and once for the bow with the pink fondant. (Now it’s a multitasker! j/k) Then I picked out the features with a bit of melted chocolate on the end of a toothpick. I even let her decorate a couple of the faces. Because (and I do have to keep reminding myself of this) this is for her, not for me. For the big cake, I drew Hello Kitty on the top with melted chocolate and a coffee stirrer. Pretty proud of executing a 3D ribbon with the pink fondant. And the kid was happy with it, which was, honestly, the whole point. Then I didn’t take any pictures. Oops! Fortunately K took pictures during the actual event, so I was able to crop this one out. I did finally remember to take a picture, while we were cleaning up after the party. Happy birthday, little one. May I always be able to fulfill your desires… in a way that pleases both of us. I’ll get to the spinach garlic soup in a minute. See, my friend was talking about his blog, and how he never updated it because it felt too much like work (he researches things and then writes about them for a living), and therefore he felt he had underperformed as a blogger. “I’m sure you’re not,” he said, rather automatically. So there you go. Welcome from the world’s worst food blogger. I have a ton of catching up to do; I think I trailed off before the closing weeks of the CSA, so I’ll need to dig those pictures up from somewhere. Also, I went crazy at the last farmer’s markets of the year (great deals! ), and hopefully the bushels (!) of apples in my basement are still doing okay. And my last post is of the kid’s food purees, which seems like forever ago; now, the kid is working on his first tooth, and will enthusiastically gum up rice crackers, Cheerios, and anything he can grab off my plate. Things change fast when babies are concerned. Anyway, if your holiday season was anything like mine, it was full of overindulgence. Our many dinners with extended family starred delicious pulled pork, brisket laced with chipotle, lamb roasted on the bone, and Peking duck. The dessert plates were even more deadly, with all manner of cookies, candies, and cakes, as well as fireplace s’mores. The waistlines of my pants still fit, but – let’s be honest – rather more tightly than before. So when the New York Times posted up a recipe for Garlic Soup with Spinach, I was excited. A soup with garlic and spinach sounded like a wonderful antidote to all the fat and sugar that I’ve been consuming. However, after reading it through, the recipe didn’t sound all that good to me. Just two to three cloves of garlic, for four servings? That was hardly enough garlic to justify the name. And what was with the elbow macaroni and the eggs? So I made my own, with much more garlic, sauteed a little for extra flavor, and a big bag of frozen chopped spinach. The tang from the garlic permeates the soup, the spinach makes you feel healthy, and the turkey stock still made it feel like it belonged in the holiday season. In a saucepan on medium-high heat, melt the butter into the olive oil. Throw in the minced garlic and let it sizzle for a minute or two, stirring every now and then, until the garlic is cooked but not brown, and the entire kitchen smells sharp and fragrant. Then pour in the stock and bring to a boil. Add the spinach to the boiling stock and cover; let it cook for about five minutes, or until the spinach is cooked through. Then take off the heat and stir in the cheese. Salt and pepper to taste. Serve with a little sprinkle of extra cheese on top. We had ours for breakfast, with potato pancakes. (The potato pancake mix was part of a Christmas present from family in Wisconsin — I love food-centric gifts). The kid liked the soup so much that I made it again, throwing in some Israeli couscous and letting it cook up before adding the spinach. This soup is so easy to make that I think I’ll be making it regularly throughout the winter. Maybe even with elbow macaroni. I’m still not sold on the eggs though. The kid is eating (somewhat) local and organic above; the green beans and spinach were from the freezer aisle at the supermarket, but the sweet potato came from the farmer’s market, and the beef is from Wagon Wheel Ranch. 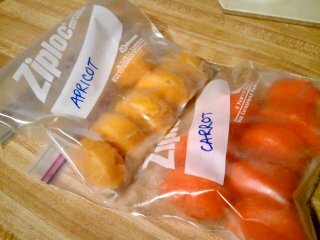 Storage is also easy; after making a puree, it’s simple to smush it into covered ice trays and freeze overnight, and then plop the cubes into freezer bags for storage. 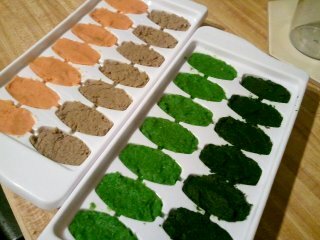 I put them in the fridge to defrost overnight, and in the morning I mash them up and package them for daycare. No, the issue is that the baby keeps eating, which means I need to keep cooking. He currently eats up these little cubes at the rate of about four a day, plus half a banana, and occasionally shows signs of wanting more. Back when his diet was more limited, it felt like I was making applesauce and steaming carrots all the time. Now I can mix it up. Oh, and another thing I didn’t anticipate: the sheer volume of dishes to wash. He goes through two or three tiny containers a day. We originally bought these Oxo containers for freezing, but food defrosts so slowly in the containers that I now just use them for packaging meals for daycare. They’re the perfect serving size for him. However, each one splits into four parts for washing; they never dry all the way in the dishwasher, so we hang them on a drying rack and then reassemble them when dry. Sometimes it feels like I now spend a large fraction of my time shuttling baby food storage parts back and forth from dishwasher to drying rack to countertop to refrigerator to daycare and back again. It’s okay; if I’ve learned anything from parenting so far, it’s that all stages are temporary. Soon I can send him to school with finger foods instead of purees… and then, when he’s older, maybe he can even pack his own lunches! Hopefully he’ll still like vegetables.